No one likes your cooking; hence, a lack of positive re-enforcement, which god knows we all need more of. It takes too long. Consider this might be due to a lack of practice. Dull knives. Did you know that a good kitchen knife costs $50? Be careful though, if you are used to the dull type, you don’t want to cut yourself. Choose simple recipes with fewer ingredients – try to get ingredients you can spell, I find that helps. Stuff tastes better if it was grown locally, picked closer the day you bought it. Try farmers markets, it’s better for the environment, too. 8. Practice with small groups, or even for just yourself! 9. Ask for advice from those you know who are good cooks. 10. 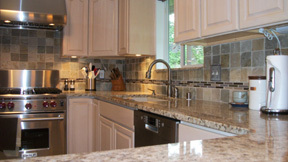 Maybe your kitchen needs a make-over, so you can find the measuring cups and spoons, the right size pot or bowl. A new sink will be a pleasure to use – no gross black stuff you have to scrape around the edges or dings in the enamel that you wonder if it is harboring some dangerous microscopic life form. Not to mention a new gas range . . .